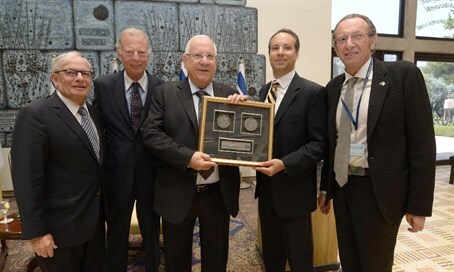 Rivlin hosts delegation of 140 representatives in celebration of the organization’s 65th anniversary. President Reuven Rivlin on Sunday hosted a delegation of 140 Israel Bonds representatives together with Izzy Tapuchi, the organization's president. “Israel Bonds is not just a way to show support for Israel, it is a way to show faith in Israel; faith in our growth, faith in our development, and faith in our future,” said the president. Rivlin further addressed the socio-economic challenges the country faced as a result of the changes in society and gaps between the different communities. "The President's Office is proud to be involved in a number of projects, bridging the gaps; in schools and on the sports field, in the classroom and in the workplace,” he said. Israel Bonds is the commonly-known name of Development Corporation for Israel (DCI), the U.S. underwriter of debt securities issued by the government of Israel.